Summer in Jackson Hole, Wyoming is what I would imagine any day in heaven would be like. The weather is perfect, not too hot, not too cold. Wildflowers are in bloom. Babbling creeks and rivers run through the valley. Wildlife roams freely and everywhere you look you are surrounded by the picture-perfect mountains that seem to jut straight up out of the valley floor. Doesn’t it sound like paradise? While winter in Jackson, Wyoming is also beautiful, summer is definitely my favorite season to visit. During the summer, locals and visitors to Jackson Hole alike take advantage of the three months when the weather is actually warm and spend a lot of time exploring the great outdoors. 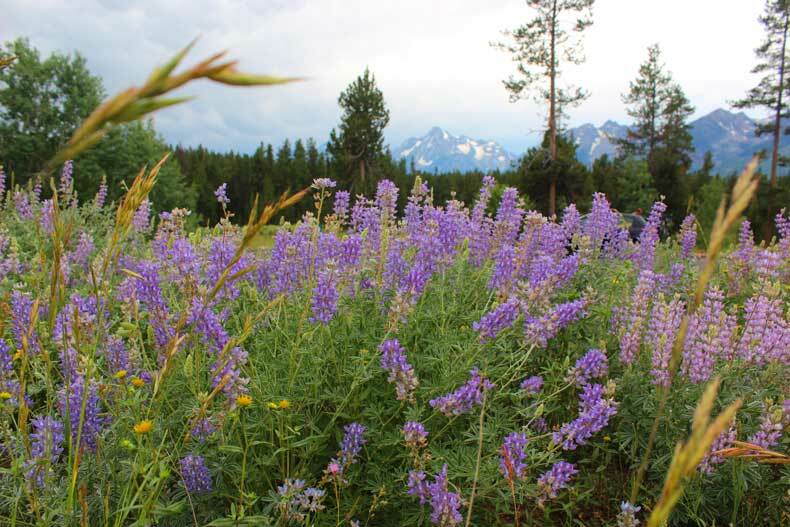 Nature lovers will find plenty of things to do in Jackson Hole in summer, with or without kids. Hiking is one of the most popular activities in and around Jackson Hole in the summer season. Jackson Hole has some of the most accessible hiking trails in the country. The trails are well-marked, defined, and range in length and difficulty. You can do a simple day hike, spend a couple hours hiking as a family, or buy a permit and spend several days hiking and camping out in one of the areas stunning national parks. If you plan to hike in this area of the country, bear spray is definitely recommended. You can easily buy it at the Grand Teton National Park Visitors Center before your hike. Word of warning: you cannot fly with bear spray, even if it is in your checked luggage. So buy it when you get there, and if you don’t use it (which hopefully you won’t) you can donate it back to the national park. Cycling is also a popular summer activity in Jackson Hole. 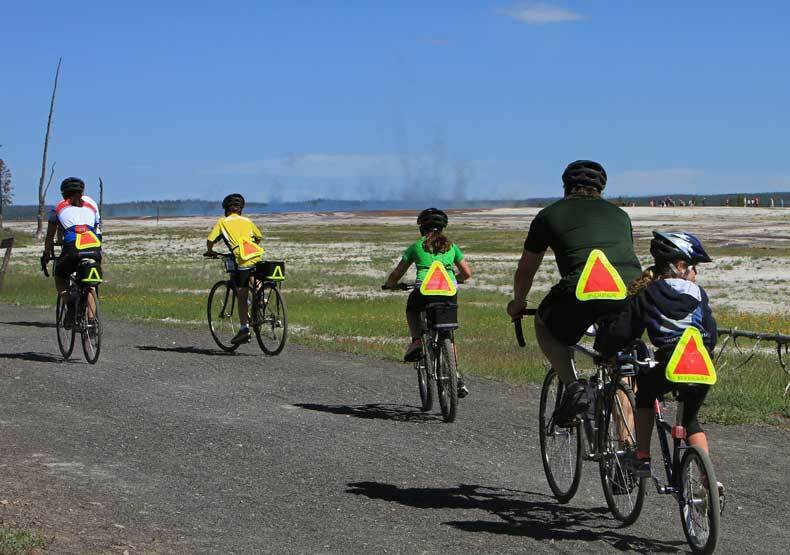 The roadways have great biking trails alongside to protect cyclists from oncoming traffic. The varying terrain makes for some exciting, yet difficult rides. And of course you have incredible scenery that would make anyone want to cycle longer. If off-road mountain biking is more your style, head to Jackson Hole Mountain Resort. In summer, the challenging ski resort turns many of it’s ski runs into biking trails. You’ll find trails for every level – from novice tracks to adrenaline pumping terrain and jumps. Even if you have no desire to actually catch any fish, a day spent out on a kayak or even lakeside at Jenny Lake is a day well spent. 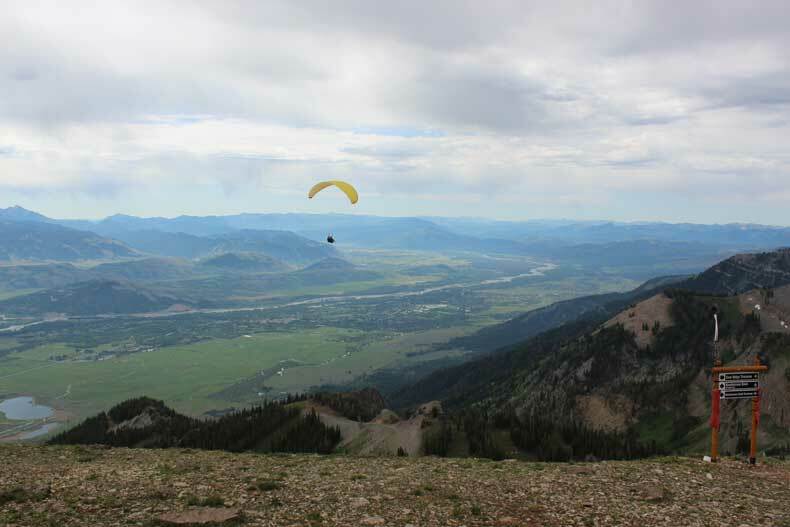 If you are up for something a bit more adventurous, paragliding is offered at the Jackson Hole Mountain Resort in summer. You can take the tram up to the top of the mountain for spectacular views of the valley. And if you are brave enough, para-glide over it. No trip to Jackson Hole in the summer is complete without making the hour-long drive to Yellowstone National Park, one of the most beautiful national parks in the United States. 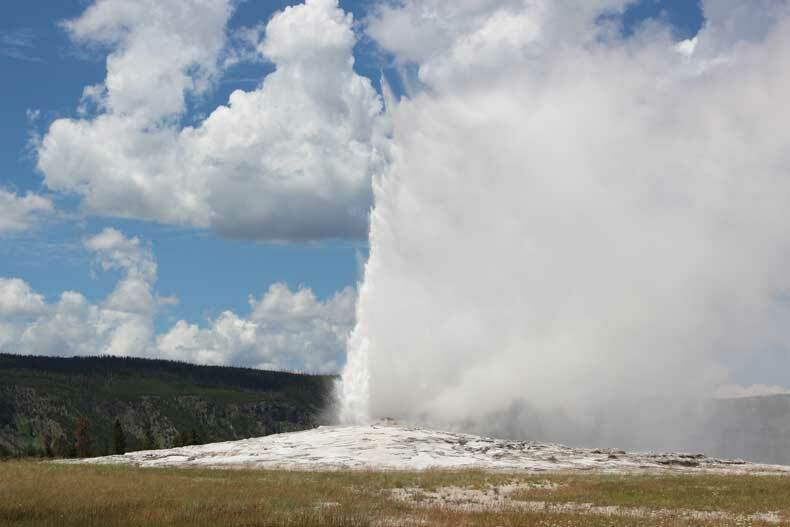 Not only can you witness Old Faithful erupt, but you can view numerous geysers and beautiful waterfalls up close. Plan to spend at least a full day, if not a few days, exploring Yellowstone. It is huge and there is a lot to see and do. There is a hotel in the national park if you do not want to make the drive back to the town of Jackson, or you can also camp out for the night in the park. Children will love Yellowstone, just watch them closely, and make sure they stay on the trails around the geysers as the ground can be soft and dangerous (if not fatal) if they fall through. 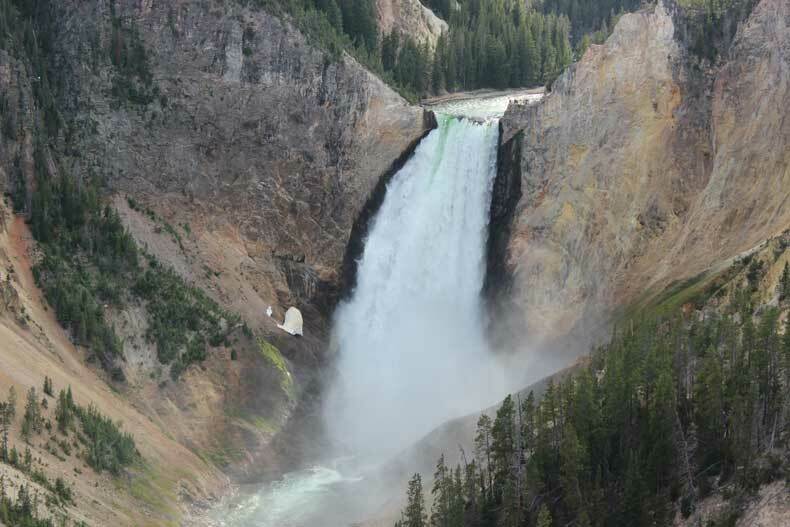 Planning to visit Yellowstone with kids? This post will help you plan your trip! You’ll have the joy of seeing a wide variety of wildlife in the park. 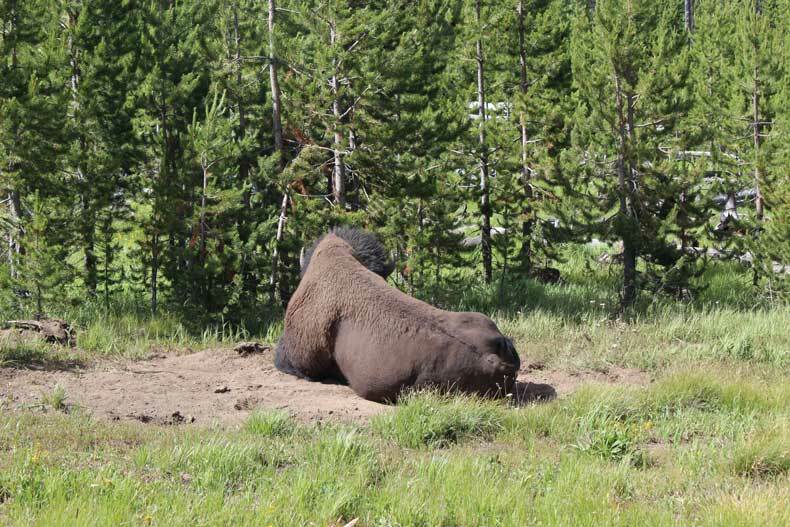 From bison to moose and even bears, Yellowstone is home to 61 different mammals. As always, respect the wildlife for what it is: wild. It’s best to stay in your car or keep your distance if you see a wild animal in the area. This area of the country is a playground for adults and children alike. Definitely visit, but play by the rules so your family stays safe and protected. Like Yellowstone, Grand Teton National Park is a must-visit for anyone visiting Jackson Hole in summer. The two parks are adjacent to each other, making them easy to visit together. Grand Teton National Park is perhaps most known for it’s captivating views of the Teton Mountains, a sub-range of the Rocky Mountains, that are simply breathtaking. 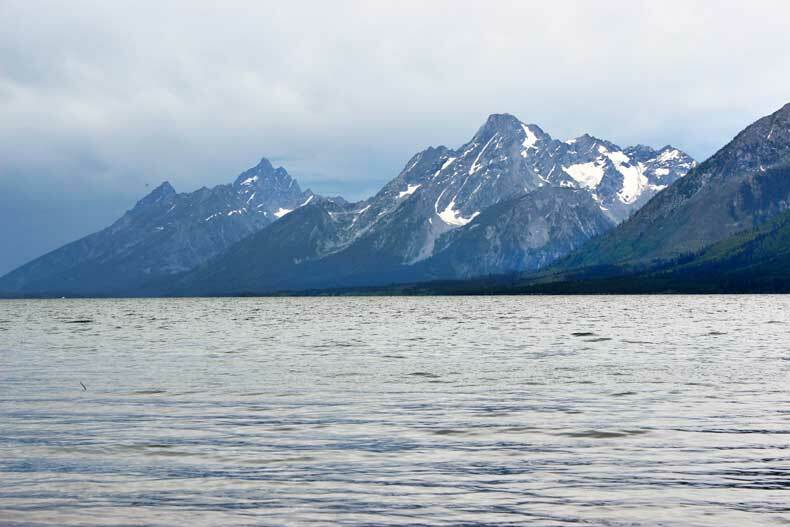 Hiking, camping, fishing, and canoeing are all popular in Grand Teton National Park, as well. You will want to bring your camera along, as the rugged scenery in the park is postcard-worthy. Looking for more information on hotels, restaurants, and the town of Jackson, Wyoming? Check out our complete family-friendly guide to Jackson Hole. Have you been in Jackson Hole in summer? 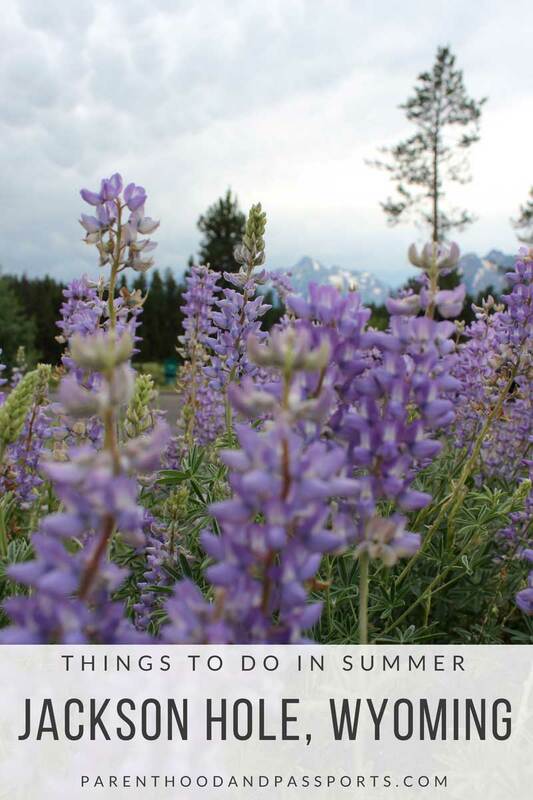 Leave us a comment below and let us know your thoughts and favorite activities to do during summer in Jackson Hole.